Climbing frames from Selwood are prepared for self-assembly however at Climbing Frame Installer we provide an affordable professional installation service for anyone who is not confident with building a DIY playset or simply does not have the time. Our climbing frame builders have years of experience in assembling outdoor climbing frames from Selwood and most other popular manufacturers. 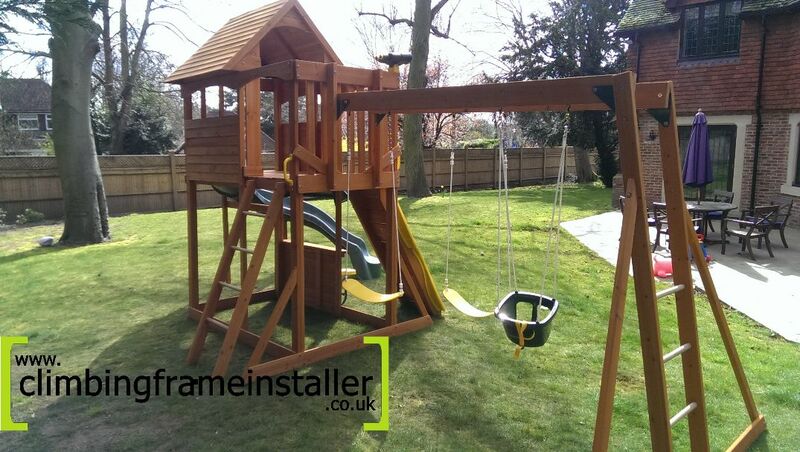 Our certified play frame installers specialise in safely installing children’s playsets so you can be confident that your climbing frame is safe for the kids to play on. The Audley climbing frame from Selwood is a stunning, jam packed playset which is designed with medium to large sized gardens in mind due to the wide range of accessories and expansive play tower included. 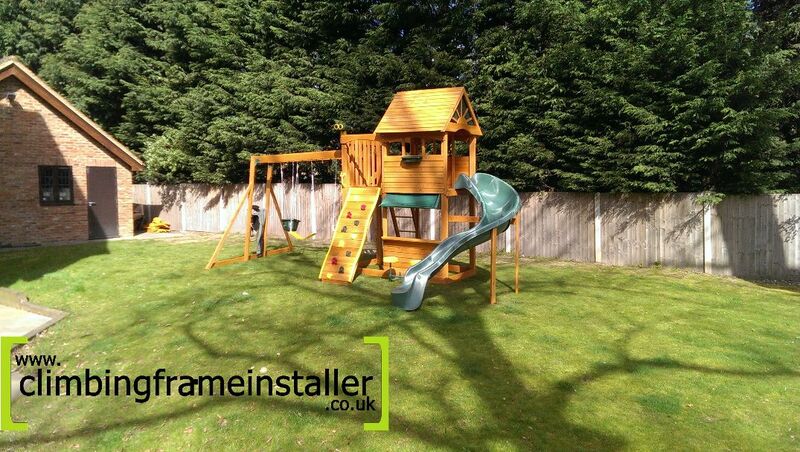 The Audley climbing frame features a wooden play tower with both an upper and lower play cabin as well as a railed balcony for children to climb to, a curved slide, rockwall, monkey bars, swings, a picnic bar, step ladder and more. The Audley climbing frame is similar to other play frames in the Selwood range including the Audley Deluxe climbing frame, the Ickworth, the Arlington Deluxe, the Stonefield Lodge, the Sandpoint climbing frame and more. 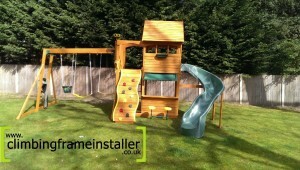 Selwood also offer a wide range of p laysets suitable for smaller gardens with just as much fun factor. The Audley playset includes a wooden play fort which features a raised playhouse supported by the play deck which is approximately 1.5m tall. The upper playhouse is a fun enclosed saf e area for children to climb to and is spacious enough for several children to play in at once. The raised play cabin is enclosed around the outside to keep kids safe while playing but it does include windows like a playhouse that children can see out of plus they also give the playset a fun character t oo. Beneath the play deck there is an open play space which is sheltered by the deck too. It makes a great play space or even an area for storing other outdoor toys too. The front of the lower play area and play fort features a partial wall with a window hatch/ picnic bar. The window hatch can be used as a picnic bar because there are picnic stools at the front of the climbing frame for kids to sit at. 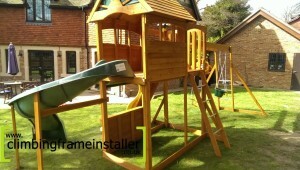 The spacious play tower included with the Audley climbing frame also includes a balcony area at the side of the upper playhouse. The balcony area is the same height from the ground as the play deck and joins it to make one large floor area for children to climb to. The balcony area provides more space for children to play in but it is not covered by a roof. 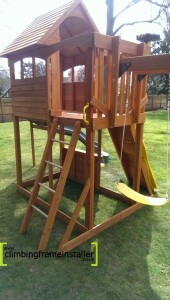 The balcony is railed around the outside to help keep little ones safe while playing in the play fort too. Kids can use either the step ladder at the back of the playset or the rockwall at the front to climb to the play deck and balcony. The step ladder at the back of the climbing frame is a slightly less challenging climb than the rockwall so is more suited to younger children and less confident climbers. The rockwall is a fun way for children to test their strength and coordination plus it is a great way to keep older children amused. The curved slide at the side of the play fort is a fun way for children to exit the upper playhouse and it is a very popular climbing frame accessory too. 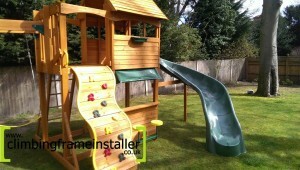 The curved slide is a great way to save space inyour garden as it takes up less space than a straight slide would. The curved slide which is included with the Audley and the Audley Deluxe climbing frames bends around from the side of the play tower to the front and provides a fun ride down from the play deck. 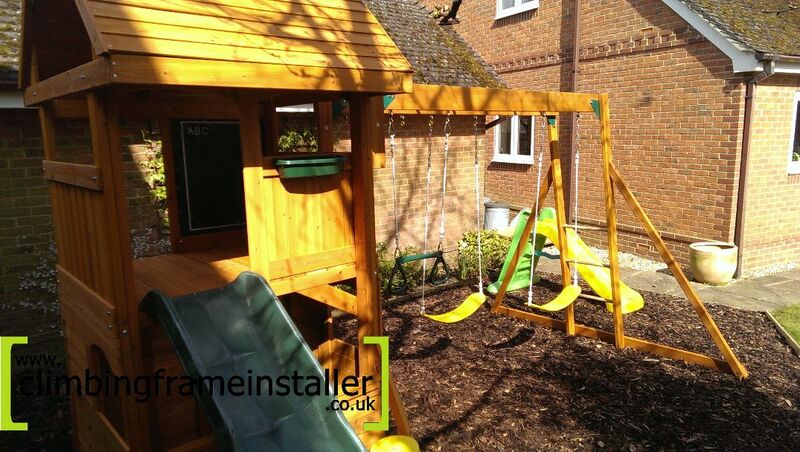 On the opposite side of the play fort is the combined monkey bar swing set which is also a very popular accessory that is featured in many of the Selwood play frames as it is a fantastic way of saving space but still gives children two activities in the space of one to enjoy. The Audley swing set includes two flexible belt swings as well as a trapeze bar which is a fun alternative to add to the swing beam. 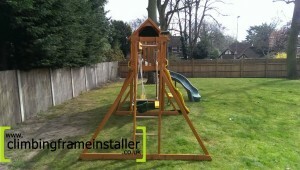 The Audley climbing frame pictured includes a baby swing which can be purchased as an extra to any playset should you have young children in the family. Monkey bars are always a great ad dition to an outdoor climbing frame as they provide kids with a challenging accessory that they will not get bored of or grow out of too quickly. Monkey bars are also a brilliant way for kids to develop strength and coordination and grow their confidence. For help with installing your climbing frame contact the climbing frame installers today for a quote. Our team of experienced playset builders will ensure your playset is safely and correctly assembled and ready to play on in no time.